I knew of Greg van Eekhout as a writer of wonderful young adult and middle grade novels, and I decided to review this book for Guys Lit Wire because I thought it was YA. Spoiler alert: it's not. There are a couple scenes of intense violence, including one particularly horrific one near the start. So recommend with care, particularly to younger readers. But for boys looking beyond the YA section who can handle some more mature content, California Bones is an excellent choice. 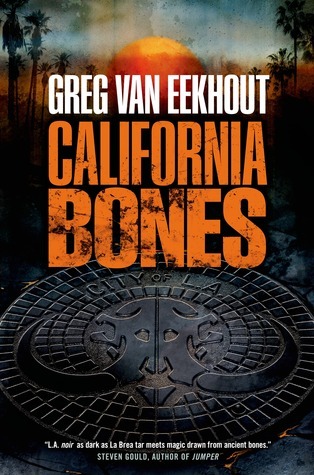 Because for all its blood and curses, California Bones has the heart of a YA novel. THIS IS A VERY GOOD THING. It has the fast pace and hyper-focused plot, the protagonist struggling with what kind of person he wants to become. Daniel is in his twenties, but his dilemmas are that of a YA protagonist - he loves his friends and wants to protect them; he rejects the pressure to "grow up" and get a legit job; he grapples with the unwanted responsibilities his father foisted upon him. That's part of the real magic flowing through this story of warring magic systems. Is it wrong that I loved this book because it confirmed my suspicions that Los Angeles is a terrible place of evil and atrocity? I mean, I loved it for a bunch of reasons, but one of them is how well it takes the city as I've experienced it in my limited time there, a humid swamp of snarled traffic and tar stink and human desperation, and transforms them into a steaming magic world of mammoth tusks and dragon scales and dictatorship and hipster coffee shops. Like the movie Chinatown (or its remake, Who Framed Roger Rabbit? ), this is a mythic Los Angeles, one where human greed and fear and hate bring the landscape to life. California Bones is an achievement of atmosphere, of place and setting, as well as worldbuilding and magic-system-making. Human characters don't stand much of a chance in a world so foul and fraught, but it sure is fun watching them try.